Deeping were winners of the Under 10 'Fair Play' tournament at the ABAX Stadium. Youngsters from across the county descended on the ABAX Stadium for an under 10 festival of football. Sixteen teams entered the inaugural ‘FairPlay’ tournament for under 10 teams from clubs across the region and it was Deeping who ultimately lifted the trophy after a sudden-death penalty win over Holbeach Yellows. The 16 teams were split into four groups of four with the winners of each section progressing into the semi-finals. The tournament was designed to reward those teams who took up flag-bearing or penalty packages during the season at the ABAX Stadium. The event, which was backed by foreverposh, was the first of its kind to be held in the close-season at the stadium and the club hope to build on it for next year. 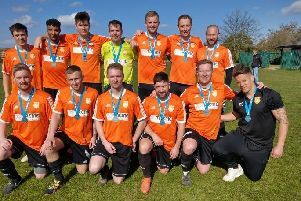 A club spokesman said: “Firstly, we would like to thank foreverposh for their backing of the tournament and for their support. “We were fortunate that two match officials gave up their time to referee on the two pitches, which was really appreciated by both the players and the managers.